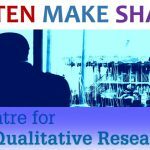 The Centre for Qualitative Research will end the academic year with a final “In Conversation” Seminar this Wednesday at 1 pm in RLH 201. All are most welcome! The presenters originally set for this date had to postpone until next year due to ill health. We decided to go ahead with the seminar anyway. It will provide us with a time in which to converse about the year’s seminars, what was helpful, and what people would like to have as topics next year. We also will be discussing the potential of short hands-on taster sessions with arts-based research methods for next year. Perhaps you have a idea for an ‘In Conversation” seminar that you would like to contribute? Do come along and join in the conversation! We look forward to spending this time together. CQR Members and non-members equally welcome!